Decapitated: Jack Fields—Wharton County, and Charles Myers— Tarrant County were both completely decapitated and Clemente Apolinar—Bexar County was almost decapitated. 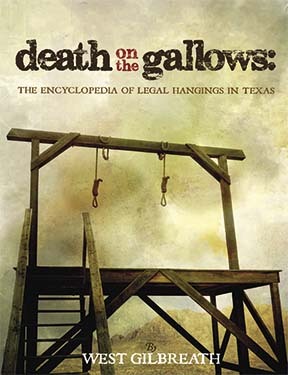 Had to be hanged twice: Joseph Brewster—El Paso and Jack Williams—Wharton County, and Jack Post of Young County had to be hanged twice at their executions. Famous Hanging: Joshua Bowen—Gonzales County was the brother-in-law of John Wesley Hardin and declared up to his death that the witness identified him wrong, and that it was John Wesley Hardin who committed the murder. Mass Hanging: In 1917, thirteen African American soldiers from the 24th Infantry Division were hanged in Bexar County for murder and mutiny, when they took part in the Houston riot on August 23, 1917. The racial disparity of those executed in Texas is also of note when you consider 280 of those executed out of the 467, or 60% were African American, during a time when African Americans made up only about 22% of the population in all of Texas. Thoroughly researched by West Gilbreath, a career law enforcement officer, this book is a must for any Texas history buff, as well as school and public libraries.